Snow Storm ’09 Wrapup…What Happened? I woke up with a headache today (really, no drinks after the shows yesterday)…must have been lots of that stress hormone running through me yesterday afternoon and evening. What a depressing day for forecasters here in Portland. It’s time to break it down and see how things panned out. First, let’s get this out of the way: We (I) really screwed up this forecast! We apologize to those of you stuck in the worst Metro area commute in my 18 years forecasting here. See, that wasn’t so hard…the air feels more clear now. Let’s answer a few questions. WHY WAS THE STORM & TRAFFIC SO BAD WITH ONLY 2-4″ SNOW? 1. It wasn’t forecast: 1-4″ of snow was widespread across the metro area with no one forecasting more than “maybe it could start as snow”. No TV weather people or the NWS. 2. Because of that no one had alternate plans or drove their “snow cars”: I normally drive a crappy (in the snow) two wheel drive that gets great mileage. I only drove the 4 wheel drive because I expected something frozen at my home in the western Gorge. Otherwise it would have happened to me too. 3. Timing was the worst it could be: The beginning of the afternoon commute when thousands of us were at work. If it was 6-9am most would have stayed home. If it was at 8pm everyone would have made alternate plans for the next morning. We were trapped at our workplaces. WHY CAN’T YOU PEOPLE EVER GET IT RIGHT, YOU’RE WRONG AGAIN! I have received 2 emails about this and seen harsh criticism on the Oregon Media Central site plus a few on this blog as well. I am keenly aware (being in the TV business) that often “perception IS reality”. For years there will be residents that remember the big storm “they” screwed up…”see, they never get it right!” I could have 100 correct forecasts, screw up one big one and people will only remember that one. That’s human nature; so it goes, I’d be the same way sitting on the other side of the TV tube. But let’s get rid of all emotion and look at the reality. We’ve hit almost every major weather event the last few years. Here’s a list: 1. Last year’s major cold wave forecast 7-9 days ahead of time. 2. Snow arrival with cold wave forecast several days ahead of time. 3. Biggest snowstorm in decades forecast 3-4 days ahead of time last December (20th). 4. Worst heat wave in decades forecast 5-7 days ahead of time last summer. 5. Severe thunderstorms on June 4th. We knew, and mentioned, that good chance for afternoon storms moving into the Valleys. 6. Major cold spell this December forecast 5-7 days ahead of time by most of us. The last time we really screwed things up was January 2007 (almost 3 years ago), remember the trace or so of snow that turned into 3-5″? So I think we’ve done pretty well the last 5 years. WHY WAS THE FORECAST SO BAD? It clearly shows the evaporative cooling around 4pm as the precipitation starts, lowing the temp to 34-35 at PDX. Not so bad eh? So in the end, the weather system came in on schedule, precipitation started out and ended on schedule, but the temperature was a few degrees too warm. Some won’t like that answer, but that’s the truth. Drew Jackson has a perfect comment on this here. I have a brief break before I go on-air and apologize to the masses for the 2-5 hour commutes this evening. I’ve been constantly busy since around 2:30pm. This blog has seen about 34,000 hits today! I’ll give my thoughts on today’s mess tomorrow when I get a chance. For now it’s obvious we won’t have any dramatic warming overnight. But we do gradually transition to mild onshore flow the next 12 hours at the surface and up above. So unless we get some sudden clearing westside metro, the only spots to refreeze will be right near the Columbia River Gorge. Post your snow totals ONLY in the comments. Any other discussion of weather needs to continue in the other posts. 3. Elevation if you know it. Ahh, the good times are returning this afternoon. Now we know the atmosphere overhead is cold enough to support snowfall here in the Valley. Looks like everyone is going to get at least a quick burst of snowfall. Most likely the best place for good accumulation will be the Coast Range “upslope” areas from Sheridan to Banks/Vernonia where easterly flow is running into the Coast Range. This also gives a slightly deeper pool of cold air out there. No reason 2-3″ can’t fall in the next few hours. Interestingly enough, the mixing of the easterly Gorge wind may keep us from getting much in Vancouver, Portland, and Gresham. We’ll get the evaporative cooling, but maybe just too much mixing to get temps down to 32 degrees. Looks like we’ll escape without snowfall in the lowest elevations of western Oregon and Washington tomorrow, but by just 5 degrees or so. An occluded front is approaching the Pacific Northwest tonight. We still have a cold and dry airmass pouring through the Gorge at the surface, while the airmass above isn’t all that warm. A long cold, clear night for maximum radiational cooling away from the Gorge is on tap once again as well. Assuming precipitation arrives as most models forecast…around noon-3pm…we should stay all liquid here in the lowlands. Our RPM model (not exactly a stellar performer so far this winter season) shows precipitation arriving soon after 9am, indicating some snow up against the Coast Range with some cold air damming there. Since it’s the only model showing an earlier arrival, I’ll ignore it. But I like the idea of cool air allowing snow to relatively low elevations from Portland north and west. In my 10pm weathercast I’ll mention snow to 1,000′ north and northwest of Portland. I’m thinking Vernonia, Buxton, and the hills in northern Clark County, Cowlitz County, and Columbia County in Oregon. If you’re traveling I-84 through the Gorge tomorrow, I’d get it done before 4pm. After that expect a steady sticking snowfall for a few hours…maybe 3″ at river level for messy freeway travel. There will probably be an area of freezing rain/ice pellets in a narrow band in the western Gorge. The cold air is very shallow west of Multnomah Falls out to Troutdale. So above about 500′ (Corbett, Washougal Hills) the precipitation will probably be in the form of rain but surface temps will evaporationally cool down to 30-31 degrees. Once the wind goes southerly tomorrow night those areas will be exposed to that warming, ending the threat after just a few hours while deeper into the Gorge the cold air will remain untouched and just gradually modify the next two days. Just explaining myself so you don’t think I’m wacko and calling for a large area of freezing rain. It’ll be localized, but it involves my home so I get to talk about it. The Thursday system looks juicy…a wet New Year’s Eve. The 00z GFS then builds ridging/splittiness over us beginning Sunday. ECMWF shows some sort of ridging as well into the first week of the New Year. Solid stratus deck in most of the Columbia Basin...notice it's pushing up through the "Lava Butte Gap" south of Bend. We’re in more of a downslope wind event today compared to the last two days. That’s where we get wind coming right over the Cascades as well as through the Gorge. 1. Cascade west slope locations are significantly colder than yesterday at this time. Wanderer’s Peak SE of Estacada was around 40 at this time yesterday; it’s 27 today. Horse Creek SE of Molalla was 64 for a high yesterda at 3,400′. Today it was 30 degrees colder! Only 34 for a high. Cold air is spilling right over the top of the Cascade crest from the cold pool (shows as low clouds on satellite image) east of the Cascades. Notice most of Clark county is windy today too; yesterday it was calm in most spots. 2. Peak wind gust last hour on the Glen Jackson bridge was over 50 mph, but Corbett (in the west end of the Gorge) has backed off with only gusts to 40 mph in the last hour. Steve Pierce was up at Crown Pt. at noon and says a person recorded a gust to 74 mph. Real windy, but not as wild as you would expect up there. 3. Wind direction at PDX is east…a true “gorge wind” at PDX is from the ESE, or about 120 degrees. 10:30pm Update: 00z models are looking drier for tomorrow…good news. I took the gamble that we probably won’t see any moisture tomorrow in the forecasts. I DO notice the 00z SLE sounding is pretty darn close to snow. So if we see something it could be either a sprinkle OR a flurry. I still think we’ll stay dry anyway. Our RPM model shows a second surge of moisture coming up from the south after dark tomorrow evening, but it tends to be to wet so…well…you get the idea. Otherwise pretty quiet through Tuesday morning with east wind easing off a bit more. PDX-DLS gradient has dropped from around 11mb. last night to about 8mb. this evening so the wind has backed off and won’t be nearly as strong tomorrow. Tuesday COULD be interesting since we still have easterly flow as a strong front moves inland with lots of moisture. This might produce signficant snow in the Gorge and maybe some spots from Portland north could be a mix if the precipitation moves in early. Definitely more active weather on the way later in the week too. 1. East wind is going to begin raging tonight and continue through the weekend…strongest tomorrow night and Saturday morning. Gradient is up to 6 millibars at 1pm, giving gusts over 50 mph now at Rooster Rock and Corbett sensors. A gradient of 10-12+ millibars is likely by tomorrow as much warmer air continues moving in overhead over and west of the Cascades, capping a cold airmass moving westward. This setup with 850mb temps up to +8 overhead really “squeezes” the flow through the Gorge. Add to that an approaching surface low from the southwest tomorrow night/Saturday and we get very strong wind gusts, probably 65-70mph at the west end of the Gorge and 40-50 mph Troutdale/Gresham areas. Not a damaging event like last January…we had 850mb temps up around +17 then! Maybe a Saturday midday Vista House meeting??? 3. El Nino dry and mild conditions continue until further notice.…Has anyone noticed that we’ve seen no real westerly flow with a good Pacific Jet since Thanksgiving Day? We’ve either had split flow over the East Pacific/Western USA, ridging right over us, or ridging just to our west (cold spell) for most of the time. And models show the same into the first week of the New Year. Very pathetic looking if you want active weather. Both the GFS and ECMWF show another possible warm rain episode for the mountains around 8-10 days from now. 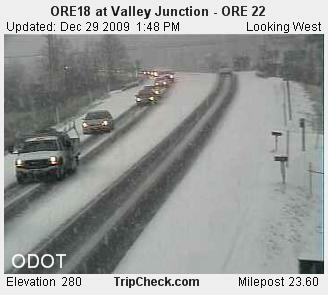 You are currently browsing the FOX 12 Weather Blog blog archives for December, 2009.